Have you ever been to Bardstown, KY? You really should go. It’s a small town at around 12,000 people or so. Most of those 12,000 people are fantastic. Helpful, nice people are the rule, not the exception. If you are looking for a bit of quiet, Bardstown is perfect. The stores downtown tend to close around five o’clock at night. The restaurants somewhere near ten. But the major thing Bardstown offers is that it sits smack dab in the heart of Bourbon Country. It’s a home to two major (and a couple small) bourbon distilleries and is a short drive from most of the rest. Sitting just off of downtown is Spalding Hall. Spalding Hall was originally built in 1839 as part of St. Joseph’s College, the first Catholic College in Kentucky. As you drive down Stephen Foster Avenue, Bardstown’s main road, don’t feel too bad if you don’t notice it at first. It is tucked behind the Basilica of St. Joseph and the grounds of the current St. Joseph’s Preparatory School. But, if you turn onto 5th Street, you can’t help but notice it. A large green lawn with large trees fronts the large Federal style building. Though built as part of the college, it has served various functions over the years. It was a hospital during the Civil War, a seminary, an orphanage and a high school. It was placed on the National Register of Historic Places in 1973. Today it houses a restaurant and the Oscar Getz Museum of Whiskey History. Oscar Getz and his brother-in-law were whiskey brokers before and after Prohibition. 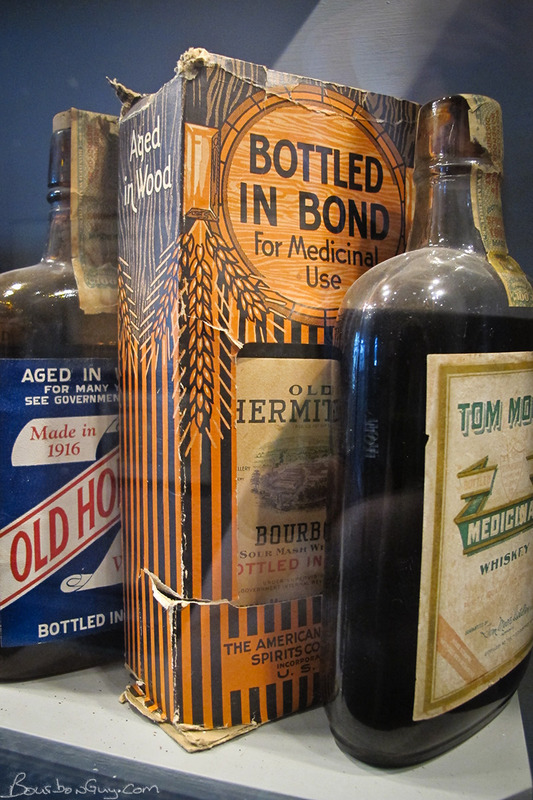 When the whiskey business started to change, they bought the Tom Moore distillery in Bardstown so that they could be assured of a steady supply of whiskey for their brands and renamed it Barton. 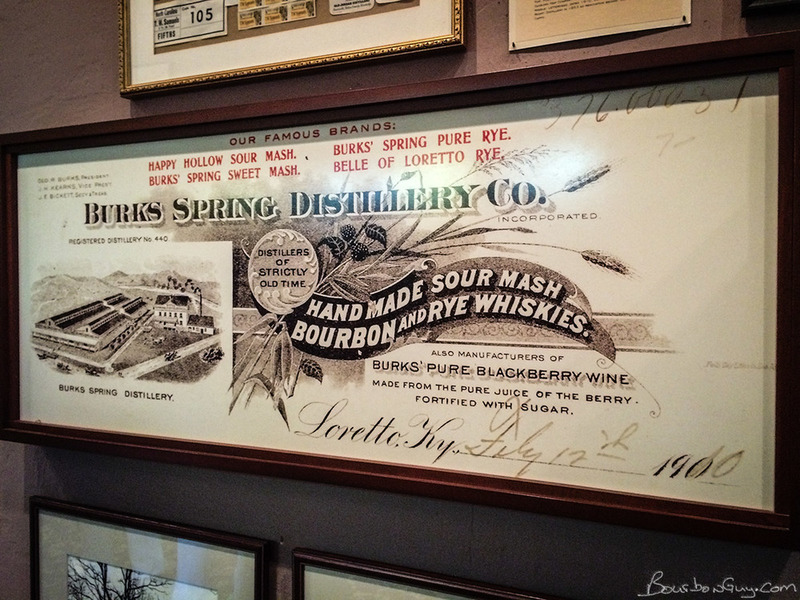 Being an avid fan of whiskey history, Getz collected whiskey memorabilia and created a small museum on the distillery grounds to house his collection. Chuck Cowdery tells us that museum was open to the public. After Mr. Getz died in 1983, his wife donated the museum to the City of Bardstown in July of 1984 and it was moved to Spalding Hall. Today the Oscar Getz Museum of Whiskey History takes up most of the first floor of the three story building. There are two wings. The one to the left (as you enter the building) houses an exhibit on distilling and aging, a replica saloon, Abraham Lincoln’s liquor license, temperance and prohibition propaganda items and old bottles. Many, many old bottles. If you take a right, there are rooms that house exhibits that roughly trend around one or two of today’s major distilleries. Wild Turkey, Heaven Hill, Brown-Forman, Jim Beam, etc. Mixed in you will find more old bottles, labels, label printing plates, advertisements and much more. It really is a must stop for the bourbon lover who finds themselves in Bardstown. An example of the age of the exhibits, the notecards were created on a typewriter. But there is a problem. The museum needs money. In talking to the volunteers, I found out that the museum doesn’t get any outside help. Though bourbon tourism is big business in Kentucky these days, drawing people in from all over the world, the state gives the museum no monetary help. 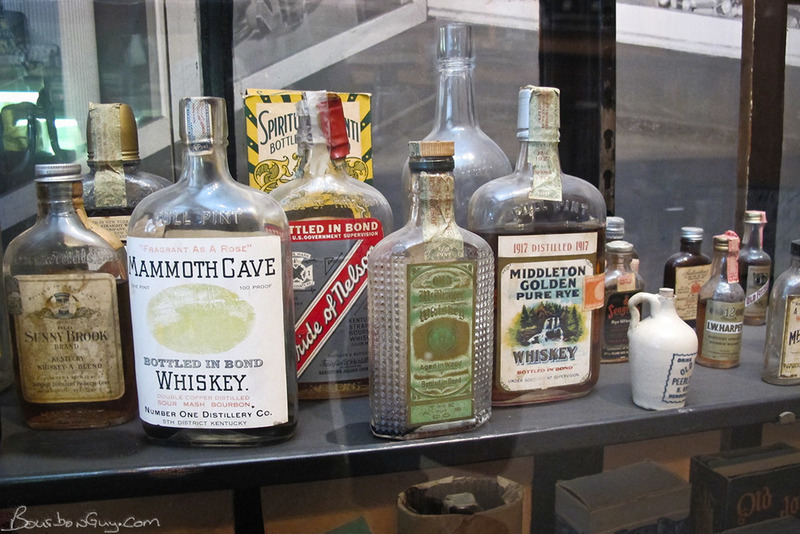 And though it houses exhibits that are basically advertisements for many current brands, the distilleries don’t give the museum any money either. Though to be fair, I was told that Barton has a couple times in the past. Instead, the musuem funds itself through various other means. During my last visit, they had a table out selling old empty whiskey bottles. They’d had a large donation and were selling off ones they already had. I bought an Old Crow “traveler fifth” bottle and an IW Harper decanter bottle from the 60s for $5 each. The main way the museum funds itself is with the Master Distiller’s Auction held each year during the Kentucky Bourbon Festival. The auction is held in the chapel of the building. The auction is sponsored by the Van Winkles and provides most of the museum’s operating budget for the year. Items up for bid include old “dusty” bottles of bourbon, historical artifacts, signed bottles of special releases, gift baskets, and other interesting items. The items for sale are all donated. Most from the distilleries in the area. I went to the auction for the first time last year and didn’t buy anything. This year on the other hand, we went in with a plan to come away with something. I was particularly interested in the dusties. Last year a few had gone at prices I could afford. This year, no such luck. A bottle of JW Dant and a bottle of Gibson’s Rye each from 1933 went for $1350 each, a quart of Old Sunnybrook from 1937 went for $500 and a pint of Prohibition era Crestmore bourbon went for $700. I was also interested in the prohibition whiskey prescriptions. Those went for about $200 each, also more than I wanted to pay. There were a couple of things I wish I could have bid on but knew I couldn’t afford and would have needed to be fairly local to use. One was a cocktail class by Joy Perrine that received no bids and that the auctioneer bought. The other was a tasting led by bourbon historian Mike Veach and that went for $400. I ended up getting a few things though. I bought an Old Forester gift box from 2008 commemorating the 75th anniversary of the Repeal of Prohibition for $95. I might have gotten a little carried away there, but it’s for charity so I didn’t mind overpaying some. But I also got a couple of things no one else wanted for less than retail. I got a bottle of 1792 plus a bottle of Bloody Kentucky bloody mary mix for $40 and a bottle of Wild Turkey Diamond plus a set of four glasses for $140. Overall I felt good knowing the money was going to support the museum and I got a couple things I would drink. Of course the really big money was reserved for more current releases of Whiskey. Yep the Pappy was the big money prize of the day. A signed bottle of Pappy 23 came in at $1600, the 20 was $1150, 15 year old went for $900, the Old Rip Van Winkle 12 year for $750 and the 10 year for $425. Overall, as befitting the corporate sponsor, Van Winkle bourbons brought in more than one quarter of the $17,000 that the auction brought in for the museum. I really recommend that if you find yourself in Bardstown, you visit the Oscar Getz Museum of Whiskey History. It’s free to visit, though there is a donation box. The building is old, the exhibits are old, the stuff inside the exhibits is old. But in this case, that’s a good thing.